Posted on Fri, Mar 16, 2012 : 2 p.m.
We're taking a bit of a detour this week for Frugal Floozie Friday. Oh, don't worry — we're still talkin' 'bout food, and focusing on great deals at local establishments! But this time, our budget of $5 per person isn't being spent at a restaurant. Instead, I'm featuring a way to have that meager amount of money go toward feeding as many as 15 people rather than just one. Who knew my frugal skills were so finely honed? Actually, I don't even think I could accomplish that feat, despite being a great sale shopper! But Food Gatherers can. And so, today's post isn't about a fabulous deal at a restaurant; rather, it's about how you can enjoy food and fun for free — yes, free! — while helping to get our regular $5 Frugal Floozie Friday budget donated to Food Gatherers so that this amazing organization can feed the hungry in our area. Today's Frugal Floozie Friday feature is the Zingerman's Tour de Food, being called affectionately the Tour de Food Gatherers for the month of March. You won't have to spend a penny while tasting great treats — really! Just visit each of the five Zingerman's shops within a 24-hour period any time during March. Taste all the great samples that are offered to visitors each day, get your "passport" stamped at each place, and then turn in your sheet at the end of your tour. Enjoy baked goods, coffee, cheese and other goodies, all at no charge — a price tag that's definitely within our mandatory Frugal Floozie Friday budget of $5 per person! And for each person who turns in a form, Zingerman's will donate the $5 you didn't have to spend to Food Gatherers, one of my very favorite organizations. Food Gatherers "is not only Michigan's first food rescue program, but the first program of its kind to be founded by a for-profit business ... Zingerman's Delicatessen. In 1997, Food Gatherers also assumed responsibility for the county food bank. Today, it is an independent 501(c)3 not-for-profit organization governed by a board of directors and operated by 22 staff people and more than 5,000 different dedicated volunteers. Food Gatherers is now the primary distributor of food in Washtenaw County." Through lots of hard work and the support of its many friends and supporters, Food Gatherers "provides enough food for more than 12,000 meals a day, bringing nourishment "to more than 150 community programs serving... mostly families and children." So, let's all do what we can to support this great cause! Here are the participating sites to visit and taste samples at: Zingerman's Deli, Bakehouse, Roadhouse, Creamery and Coffee Co.. Start wherever you like, end wherever you like, just be sure to visit each of the five within a 24-hour period and to get your "passport" stamped at each one. Eat! Eat well. Eat for free. And help your neighbors in need to eat, too. Fri, Mar 16, 2012 : 2:29 p.m.
Fri, Mar 16, 2012 : 1:41 p.m.
Mary, thanks for publicizing this. This seems to be one of those rare cases of win-win-win. 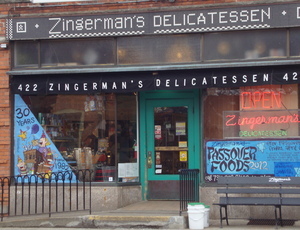 Zingerman's receives favorable publicity (yes, yes, I know - what else is new, right? ), patrons receive free samples of tasty treats, and Food Gatherers receives donations as a result. I love the dynamics of this. Fri, Mar 16, 2012 : 2:35 p.m.
Nice job on the alliteration! Fri, Mar 16, 2012 : 2:06 p.m.